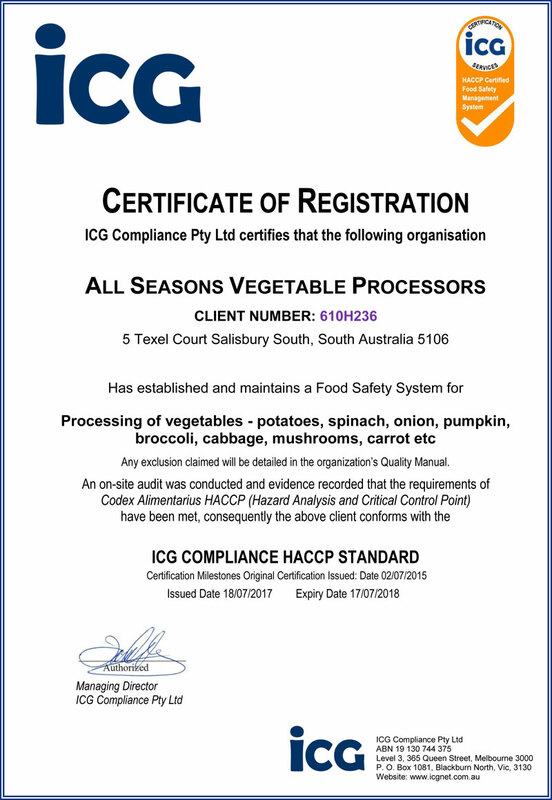 The Directors and Management of All Seasons Vegetable Processors are aware of the need to meet the contractual and generally supply requirements of its customers in all respects. The goal of the company is to become a major supplier in the packaging and processing of vegetables and to provide quality/safe product to our customers with efficient and friendly service. The company believes the HACCP principle and application of procedures provides the best means of achieving this goal, ensuring the level of quality/safe product coupled with delivery and competitive prices. Accordingly the Company has completed a quality assurance program and still work progressively toward certification to the HAACP standard and the subsequent maintenance of the standard.